Performance exhaust systems ensure that a vehicle's engine runs correctly. They also keep toxic exhaust fumes from entering the car. A high-performance exhaust system provides the best possible fuel efficiency and reduces harmful exhaust emissions that pollute the air. Other functions of an exhaust system are to mute the sound of the engine and reduce the exhaust temperature. Because cars can produce harmful gases during the combustion of fuel, it is important to visit a muffler shop right away if you suspect your exhaust system has a problem. 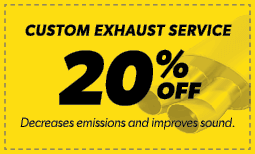 Stop by Meineke #468 in Brooklyn, NY, for a muffler repair cost estimate. It's important for drivers to know the signs of a failing aftermarket exhaust system. The easiest way to tell if there's a problem is when your exhaust system starts producing a louder sound. This means there is a leak in your high performance exhaust system. Leaks are usually caused when the flexible weave of the exhaust system starts to rust. This is the most vulnerable part of your exhaust. If you've noticed that your exhaust is louder and you're worried about a leak, contact Meineke #468 at Brooklyn, NY. and we'll diagnose the problem and take care of any muffler repairs you need. A common question we receive at Meineke #468 in Brooklyn, NY, is whether fuel efficiency is really affected by the exhaust system. The answer is yes. Your exhaust system should include an oxygen sensor. This sensor is designed to detect the amount of oxygen that is coming through the entire exhaust system. It sends a signal to your engine to either increase or decrease the amount of fuel it burns to maintain maximum efficiency. However, if the oxygen sensor is defective, it can cause your vehicle to expend unnecessary fuel. Having your oxygen sensor changed every 60,000 miles can help eliminate this issue before it begins. An old or damaged high performance exhaust system can decrease engine function, waste fuel and pose a health hazard for you and your passengers. There are several issues that can result in suboptimal function in performance exhaust systems for cars. For best results, consult an experienced mechanic if you are having trouble with your car muffler, your custom exhaust systems or other components. While some issues can be resolved with repairs and part replacements, others can only be addressed by installing a new performance exhaust system. To learn more about keeping your high performance exhaust functioning smoothly, visit our Meineke #468 in Brooklyn, NY. If you want the best performance exhaust system possible for your vehicle, don’t look any further than Meineke #468. We carry many kinds of performance exhaust systems for cars, no matter what their make or model is. Our technicians are committed to providing you with the most expeditious and affordable aftermarket exhaust services possible. Whether you are upgrading to a high performance exhaust or getting some muffler repairs done, we’ll do everything possible to keep your muffler repair cost low. Stop by one of our many convenient locations in Brooklyn, NY.